Joseph Conrad and the Performing Arts, edited by Katherine Isobel Baxter and Richard J. Hand. Farnham: Ashgate, 2009. 165 pp. £55. For readers of Conrad who tend to think of his fiction without linking it to the performing arts, this book is a useful correction in two ways. First, it demonstrates that Conrad not only took a strong interest in the theatre but also contributed to the genre of drama himself, for instance by adapting his short story “To-morrow” into a one-act play entitled One Day More and by dramatizing the novel The Secret Agent. Second, it shows that Conrad made wide-ranging and innovative use of stage and screen techniques and conventions in his fiction. The book is much more than a correction, however. Its eight chapters provide a wealth of information about, and spirited discussion of, significant aspects of Conrad’s work seen in the light of “performance.” Sensibly, the editors define the notion of performance inclusively, linking it both to the two aspects already mentioned and to the reader’s understanding of cultural specificity. For instance, Conrad’s Malay fictions express, as Linda Dryden puts it, “cultural difference through the way his characters ‘act out’ cultural codes of behaviour” (13). Dryden’s essay, appropriately entitled “Performing Malaya” and preceded by an informative introduction by the editors, Katherine Isobel Baxter and Richard J. Hand, opens the collection. As Baxter and Hand point out, the eight essays cannot possibly provide a complete account of Conrad and the performing arts. However, collectively they offer an engaging forum for a nascent area of Conrad studies – an area likely to grow in importance in the years to come. Dryden’s interesting discussion is followed by Susan Barras’s essay on Mrs Almayer’s and Mrs Willems’s performances of colonial resistance in Almayer’s Folly and An Outcast of the Islands. In common with Dryden, Barras takes a strong interest in the Malay fiction, and she manages to show that, in both novels, it is not only Babalatchi, with his covert schemes to undermine the Europeans, who provides examples of performance. Mrs Almayer and Mrs Willems also engage in performances of colonial resistance in order to protest at the way they are treated by their “white masters,” that is their husbands, Almayer and Willems. Also examining the nature of Aïssa’s performance in An Outcast of the Islands, Barras ends by suggesting that Aïssa’s own performace is less successful in obtaining mastery than that of the two other female characters. Barras concludes, I think convincingly, that both Mrs Almayer and Mrs Willems achieve what Homi Bhabha has described as “the refusal to return and restore the image of authority to the eye of power,” thus hinting, in and through their performances, at an “implacable aggression” that their European husbands can neither fully suppress nor satisfactorily contain. Critically rewarding is also Richard J. Hand’s discussion, which argues that Conrad’s fiction includes a number of significant references to, as well as uses of, popular performance, not least melodrama and commedia dell’arte. Considering melodrama as an artistic feature which is not necessarily “negative,” Hand implicitly links parts of his argument to Peter Brooks’s understanding of melodrama in The Melodramatic Imagination (1976). Usefully reminding us that Conrad is a very dramatic writer, Hand, taking his cue from Conrad’s comment that “Though I detest the stage I have a theatrical imagination” (17 April 1909; CL4 218), identifies and discusses various aspects of melodrama in “Freya of the Seven Isles: A Story of Shallow Waters” and “The Return.” Hand does not claim that these stories are masterpieces of short fiction to be placed on the same high level as, for example, “An Outpost of Progress” or “The Secret Sharer.” But he shows that, not least by dismissing a story such as “Freya of the Seven Isles” as simple melodrama, critics have tended to overlook significant aspects of the narrative. Conrad’s “theatrical imagination” is also at the centre of Robert Hampson’s significant contribution. Hampson’s critical focus is not on Conrad’s adaptations of his fiction for the stage or screen. Rather, he discusses how Conrad uses stage and screen conventions in his fiction. While Hampson identifies a number of stage conventions in “The Return” and Victory, he points out various screen conventions in The Secret Agent and Chance. For example, he shows that in “The Return,” a short story intertextually linked to Ibsen’s A Doll’s House (1879), Hervey’s performances as a character draw on the codes and conventions and of popular theatre; thus Conrad signals the inauthenticity of Hervey’s attitude. As far as screen conventions are concerned, Hampson helpfully reminds us that Conrad’s career as a novelist coincided with the early development of cinema – Almayer’s Folly was published just a couple of weeks after the Lumière brothers presented their invention to the Sorbonne. As Stephen Donovan shows in Conrad and the Popular Imagination (2005), Conrad took a keen interest in visual technologies, especially film. Inspired by Donovan’s important study, Hampson discusses various filmic aspects of The Secret Agent, a novel in which he sees Conrad responding to a new awareness of time (and the presentation of time in fiction) resulting from elements of early film such as hand-cranked cameras and projectors and non-standardised speeds. The last four essays of the volume are also illuminating. Suzanne Speidel, whose critical concerns are similar to those of Hampson, notes a characteristic ambivalence in Conrad’s attitude to the new medium. After having commented on important aspects of narrative cinema, Speidel gives an interesting analysis of Victory, comparing its narrative strategy to cinematic narration. For instance, she finds that aspects of this novel are similar to Griffith’s technique of parallel editing in The Birth of a Nation (1915). Emphasizing the intense depictions of light and dark in Conrad’s fiction, Stephen Donovan concentrates on the author’s use of shadowgraphy – the art of using and manipulating shadows. As Donovan persuasively argues, the shadows of Conrad’s novels and short stories are more than just visual traces of material objects, since they frequently add another layer of meaning (or complication of meaning) to the narrative, and since they tend to be animated by a symbolic force of their own. In the following chapter, Katherine Isobel Baxter turns to Conrad and Shakespeare – a combination of names that, with a view to the heading “Conrad and the performing arts,” has received more attention than most. The issue of influence looms large here, and dealing with influence is always difficult, since it is exceptionally difficult to identify and critically evaluate. Baxter’s discussion, however, is informative and balanced. She starts by commenting on the Shakespearean elements already noted by Conrad critics such as Adam Gillon and John Batchelor. These are mainly drawn from the tragedies (especially Hamlet), with the important exception of The Tempest. Proceeding from this helpful survey, Baxter, in the more original part of her essay, considers the ways in which Conrad’s reception and interpretation of Shakespeare was mediated through his father’s, Apollo Korzeniowski’s, works, and how – this is an important concluding point – that mediation invites an interpretative shift from Shakespeare’s tragedies to his comedies. Rounding off the collection, Laurence Davies writes with enthusiasm and insight about Conrad and one significant variant on performance: the operatic mode. Few critics know more about Conrad’s biography and correspondence than Davies, and relevant biographical knowledge is put to good use in the essay, which, however, is also distinguished by a number of perceptive observations on several of Conrad’s most important fictional works. Davies shows that Conrad, in addition to his engagement with the operatic avant-garde, was also well versed in longer-standing traditions. Davies’s survey of these, often politically radical, traditions includes a very interesting passage on the two principal houses – in Warsaw and Lemberg (Lwów) – of Polish opera in the nineteenth century. Conrad activated elements of these traditions in his writing, not least by writing in dual modes. One important such pairing was the operatic and the ironic, the one playing off the other. Like many great artists, including Shakespeare and Goethe, Conrad often reworked the conventions and ideas of popular forms. Referring to Slavoj iek’s observation in Opera’s Second Death (2002) that “a truly creative act not only restructures the field of future possibilities but also restructures the past, resignifying the previous contingent traces as pointing toward the present,” Davies concludes that Conrad not only constructs a force-field between the ironic and the operatic, but that “he ironises opera without throwing it away; he treats it irreverently with the confidence of a believer” (141). 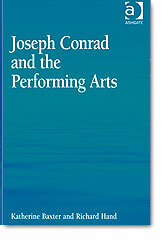 As should already be clear, Joseph Conrad and the Performing Arts is a significant contribution to Conrad studies. The editors’ and contributors’ combination of a contextual and historical approach proves thought-provoking and critically productive, thus not just confirming but considerably extending the structural, thematic, intertextual, and intermedial range of the author’s fictional performance. ody of ambitious plays” by placing them within the context of evolving theatrical traditions, including melodrama, Expressionism, Grand-Guignol, and naturalism, to argue that, despite his protestations to the contrary, Conrad’s awareness of contemporary theatre was more advanced than has hitherto been recognized. Bringing the volume to a close, Mary Morzinski challenges the “achievement and decline” claims made by Moser et al. to provide a strident defence of Conrad’s stylistic development as one of continual growth, using the manuscript of The Rescue as evidence. A linguistic approach to Conrad, this essay’s context is Second Language Acquisition, whereby the speaker develops an “interlanguage.” Analysis of such characteristics as verb tense and word order (of adverbial modifiers and adjectives) leads into a discussion of asyndeton and synecdoche to argue that the hallmarks of Conrad’s style are simultaneously aspects of his artistic techniques, and that these continue to evolve across Conrad’s career. The Conrad: Eastern and Western Perspectives series is proving to be a useful contribution to on-going Conradian scholarship and critical debate. Apart from occasional designated monographs, including Morzinski’s own Linguistic Influence of Polish on Conrad’s Style (Vol. 3: 1994), the series are largely composed of edited collections of essays that, if heterogeneous, are ultimately satisfyingly wide-ranging in their range and scope.